As shown in Elasticsearch Key Metrics, the setup, tuning, and operations of Elasticsearch require deep insights into the performance metrics such as index rate, query rate, query latency, merge times, and many more. Sematext provides an excellent alternative to other Elasticsearch monitoring tools. Open-source tools to monitor Elasticsearch are free, but your time is not. Relatively speaking, they’re rather expensive. Thus, Sematext Cloud aims to save you time, effort, and your hair! All of the above is not even a complete story. Do you want to collect Elasticsearch logs? How about structuring them? Sematext does all this automatically for you! In this post, we will look at how Sematext provides more comprehensive – and easy to set up – monitoring for Elasticsearch and other technologies in your infrastructure. By combining events, logs, and metrics together in one integrated full stack observability platform and using the Sematext open-source monitoring agent and its integrations, which are also open-source, you can monitor your whole infrastructure and apps, not just your Elasticsearch cluster. You can also get deeper visibility into your entire software stack by collecting, processing, and analyzing your logs. Sematext Elasticsearch integration collects over 100 different Elasticsearch metrics for JVM, index performance, cluster health, query performance and more. Sematext maintains and supports official Elasticsearch monitoring integration. Moreover, the Sematext Elasticsearch integration is customizable and open source. Create an Elasticsearch App in the Integrations / Overview (or Sematext Cloud Europe). This will let you install the agent and control access to your monitoring and logs data. The short What is an App in Sematext Cloud video has more details. Name your Elasticsearch monitoring App and, if you want to collect Elasticsearch logs as well, create a Logs App along the way. Go grab a drink, but hurry! Elasticsearch metrics will start appearing in your charts in less than a minute. Let’s see how to actually create some alert rules for Elasticsearch metrics in the animation below. The request query count chart shows a spike. We normally have up to 100 requests, but we see it can jump to over 600 requests. To create an alert rule on a metric we’d go to the pulldown in the top right corner of a chart and choose “Create alert”. The alert rule applies the filters from the current view and you can choose various notification options such as email or configured notification hooks (PagerDuty, Slack, VictorOps, BigPanda, OpsGenie, Pusher, generic webhooks etc.). Alerts are triggered either by anomaly detection, watching metric changes in a given time window or through the use of classic threshold-based alerts. Since having logs and metrics in one platform makes troubleshooting simpler and faster let’s ship Elasticsearch logs too. You can use many log shippers, but we’ll use Logagent because it’s lightweight, easy to set up, and because it can parse and structure logs out of the box. The log parser extracts timestamp, severity, and messages. For query traces, the log parser also extracts the unique query ID to group logs related to query execution. Note, if you run Elasticsearch in containers, setup Logagent for container logs. Once you have logs in Sematext you can search through them when troubleshooting, save queries you run frequently or create your individual logs dashboard. When digging through logs you might find yourself running the same searches again and again. To solve this annoyance, Sematext lets you save queries so you can re-execute them quickly without having to retype them. Please watch how using logs for troubleshooting simplifies your work. Comprehensive monitoring for Elasticsearch involves identifying key metrics for Elasticsearch, collecting metrics and logs, and then connecting everything in a meaningful way. In this post, we’ve shown you how to monitor Elasticsearch metrics and logs in one place. We used OOTB and customized dashboards, metrics correlation, log correlation, anomaly detection, and alerts. And with other open-source integrations, like Apache Kafka, you can easily start monitoring Elasticsearch alongside metrics, logs, and distributed request traces from all of the other technologies in your infrastructure. 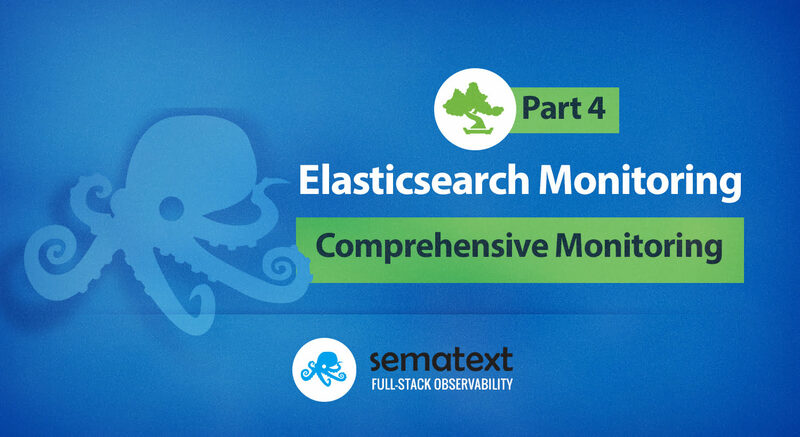 Get deeper visibility into Elasticsearch today with a free Sematext trial.